SCAFOMATIC is another of the new creations that the House of Eberhard & Co. is presenting on the occasion of Baselworld. Modern, functional lines, cleverly adapted to the sober, balanced style, which has always distinguished the Swiss House, give this watch model its particularly sporty appearance. Equipped with an automatic mechanical movement, SCAFOMATIC has a domed sapphire crystal and a generously sized (42 Ø) wholly steel case. The dial, which allows an easy and immediate reading of the time, makes a striking impact and is available in various colour combinations. They all feature a gloss finish on the flange and the regular alternation of large Arabic numerals and trapezoidal indexes in relief, all luminous, guaranteeing maximum visibility. In a central, commanding position on the case back, the ancient shield of the House provides a symbolic fragment of history that denotes the continuity and tradition to which Eberhard has always adhered. Water-resistant to 5 atmospheres, SCAFOMATIC is equipped with a black or white rubber strap with a personalised buckle, bearing the initials “E&C”, or a Chicane steel bracelet. Beguiling, gutsy, rich in temperament: just some of the thousand adjectives that denote… a sporty character for great exploits! Movement: calibre 11 ½ SW 200 – soigné. Mechanical with automatic winding. Hours, minutes, central hand for continuous small seconds. Date at 3 o’clock. 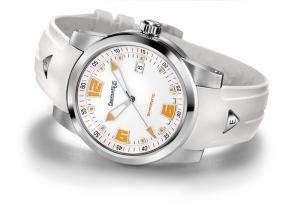 Diameter of the case: 42,00 mm. Thickness of the case: 11,40 mm. 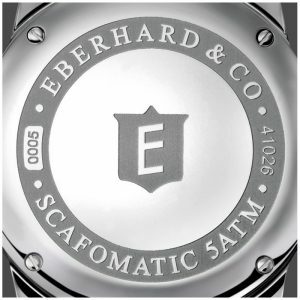 Case back: polished, secured by 6 screws; personalised with circular engravings and with the “E” shield, symbol of the Eberhard & Co. House – in bas-relief. Crown: screw-in, water-resistant, personalised with “E”. Crystal: sapphire, domed, anti-reflective (inside). Dial: large Arabic numerals at 12/6/9 o’clock and indexes, all trapezoidal and luminous. Date at 3 o’clock, with rhodium plated contour in relief. Central part of the dial matt – flange featuring a gloss finish and the seconds scale. – white – Arabic numerals and indexes in relief, with orange luminescence and rhodium-plated contour; orange markers on the seconds scale of the flange. – white – Arabic numerals and indexes in relief, with white luminescence and oxydised contour; red markers on the seconds scale of the flange. – black – Arabic numerals and indexes in relief, with white luminescence and rhodium-plated contour; red markers on the seconds scale of the flange. Strap: white or black rubber, featuring a small steel insert personalised with “E”. Buckle with the initials “E&C”.